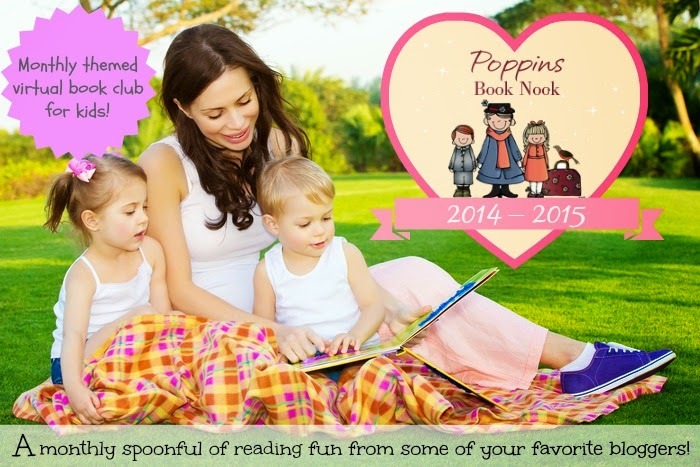 This months Poppin's Book Nook features books about the Wild West! We read 2 super fun books; the first was The Day Dirk Yeller Came to Town by Mary Casanova, and the second was The Gold Miner's Daughter: a Melodramatic Fairy Tale by Jackie Mims Hopkins. 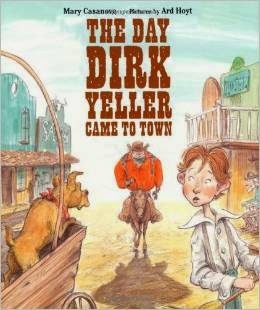 The Day Dirk Yeller Came to Town follows the arrival of what appears to be a trouble maker to a small town. All the townsfolk are scared as Dirk goes from place looking for something to stop his itchin' and twitchin'. Sam, a curious boy who has followed him all day, comes up with a winning idea when he intrioduces Dirk to the library! He even helps him sound out some words and discover a love of reading! 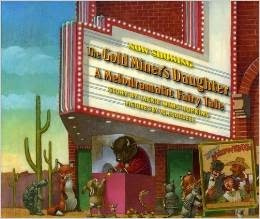 The Gold Miner's Daughter: A Melodramatic Fairy Tale combines some familiar fairy tale characters like the three little pigs with some audience participation to create a story reminiscent of early movies. The heroine (Gold Miner's Daughter) being threatened to pay what she owes the evil banker or be forced to marry him goes in search of gold. On therapy she encounters others who have had run ins with the same banker. In the end she finds the gold just not how you would expect. All along the audience is encouraged to make sounds lie, "boo hiss" and "aha" at various icons throughout the story. 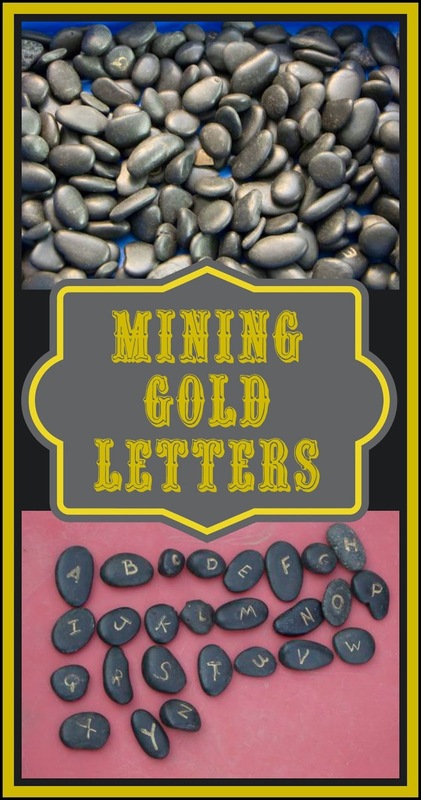 To go along with these books we Mined for Gold Letters! 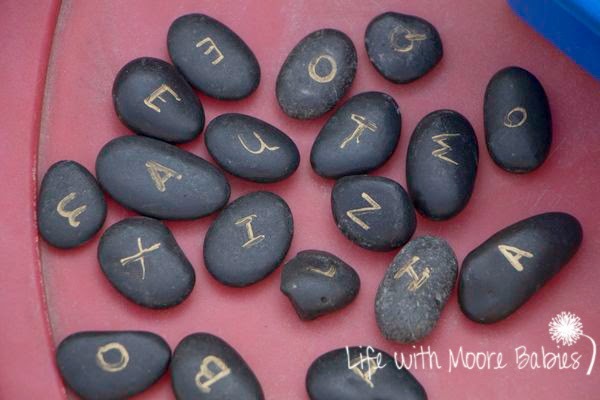 I took plain black and wrote letters on them in gold paint pen. 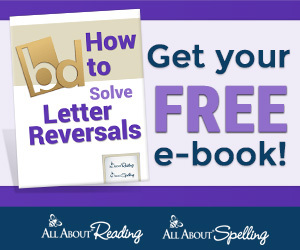 I made sure to make several duplicates of the vowels! 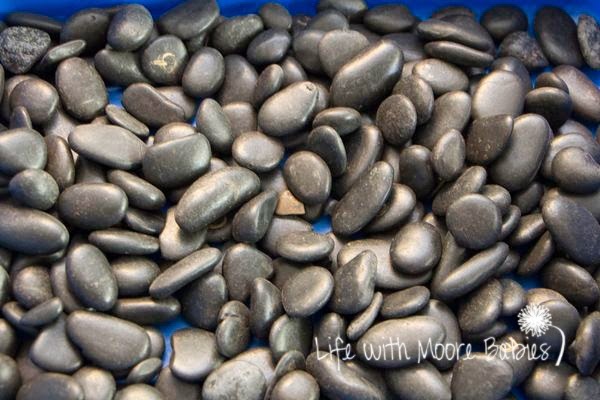 Then I threw all the rocks, those with and without letters on them in a bin. The kids were instructed to mine the bin for as many gold letters as they could find! 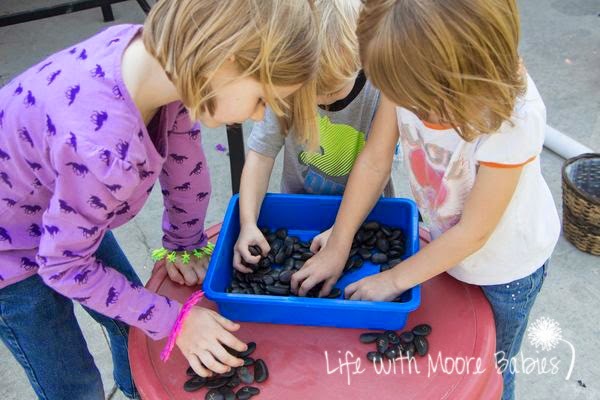 This created a frenzy with the girls trying to see who could find the most; Eli was only interested in playing with the rocks. 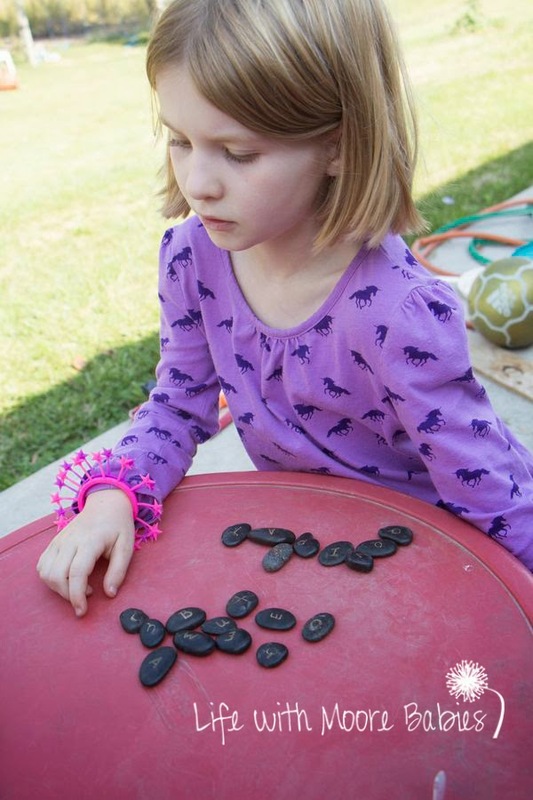 Once they found all the letters, they each had to see how many words they could spell with their letters. They came up with several on their own and even more with help. 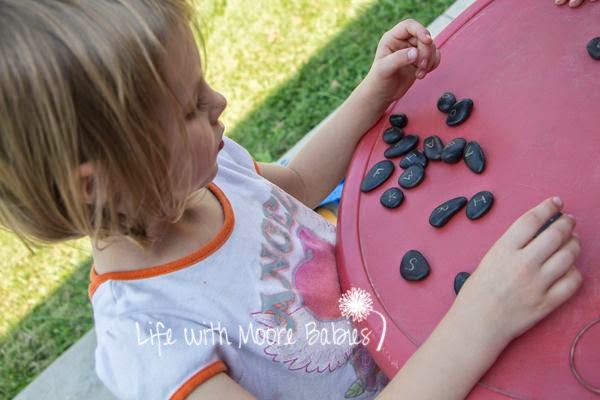 Then I had the girls alphabetize the rocks for Eli. 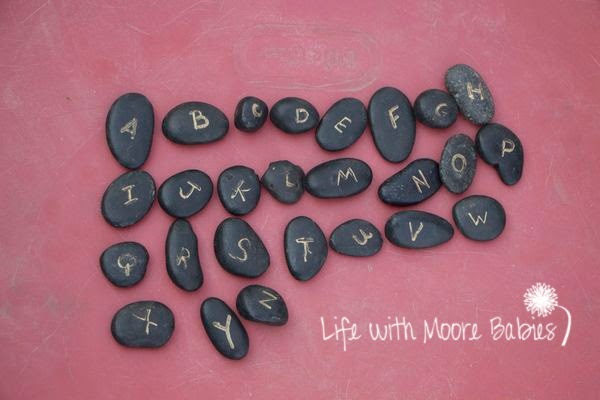 We went through the alphabet once before he ran off with all the rocks! 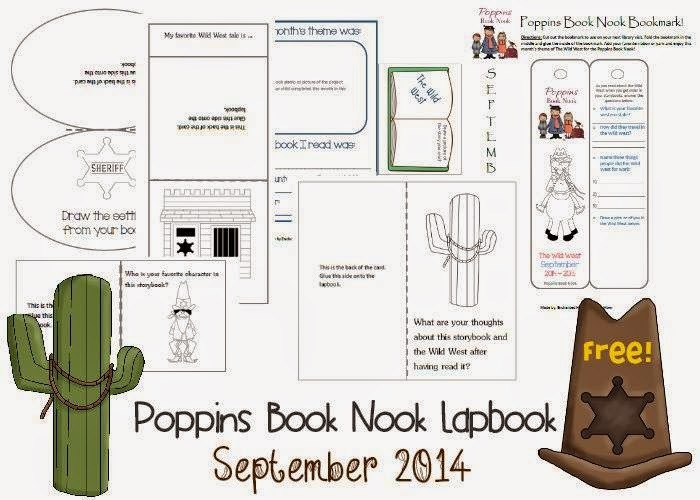 Enchanted Homeschooling Mom is offering this free Wild West Lapbook to go along with this months theme! 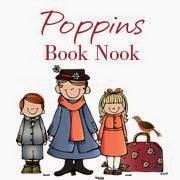 Be sure to check out all the other fabulous Wild West books featured by the fabulous Poppin's Book Nook Bloggers! 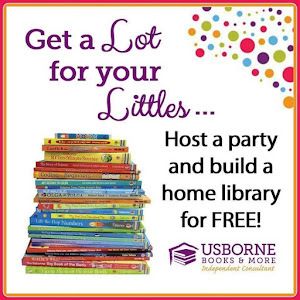 Also be sure to link up your Wild West themed fun here! Then join us next months we head Beyond Our Planet!